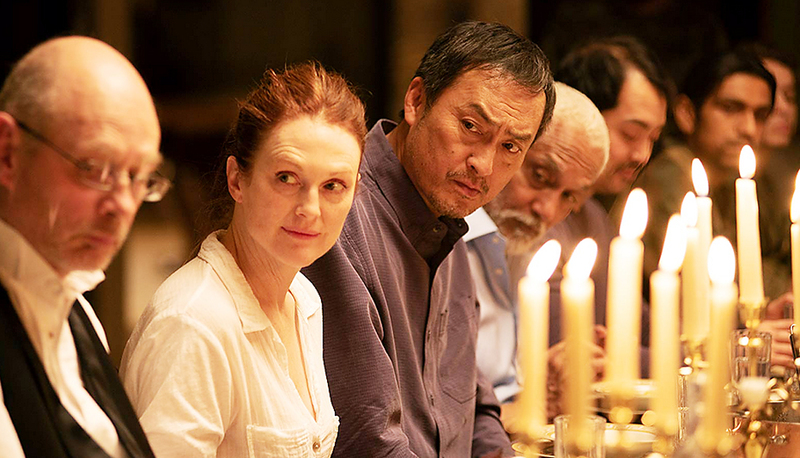 “Bel Canto,” starring Julianne Moore and Ken Watanabe, is now playing at the Monica Film Center, 1332 2nd St. in Santa Monica, through Sept. 20. It will open on Sept. 21 at Playhouse 7, 673 E. Colorado Blvd. in Pasadena, and Town Center 5, 17200 Ventura Blvd. in Encino. Based on Ann Patchett’s best-selling novel, “Bel Canto” is a dramatic love story that follows a famous soprano (Moore) who travels to a military dictatorship in South America to give a private concert at a party for a wealthy Japanese industrialist (Watanabe). Just as the glittering gathering of diplomats and politicians convenes, the mansion is taken over by a guerrilla rebel group demanding the release of their imprisoned comrades. Threats are made, lives are lost, a tense negotiation begins, and a month-long standoff ensues. The story is loosely based on the real-life takeover of the Japanese Embassy in Lima, Peru by members of the Tupac Amaru Revolutionary Movement in 1996. Hundreds of high-level diplomats, government and military officials, and business executives were attending a party celebrating Emperor Akihito’s birthday; 72 were held hostage for 126 days until they were rescued by Peruvian Armed Forces commandos. Directed by Paul Weitz and co-written by Weitz and Anthony Weintraub, the film also stars Sebastian Koch, Ryo Kase, Christopher Lambert and Tenoch Huerta. “The film benefits from the fine cast and from many sharp and poignant moments. It’s an impressive achievement technically as well,” said Stephen Farber of The Hollywood Reporter. 1 hour, 40 minutes. Rated PG-13. In English, Spanish, French and Japanese with English subtitles. Sept. 17-19 — 1:30, 4:20, 7:10, 10 p.m.
Sept. 20 — 1:30, 4:30, 7:10 p.m.
For venue information, call (310) 478-3836 or visit www.laemmle.com.